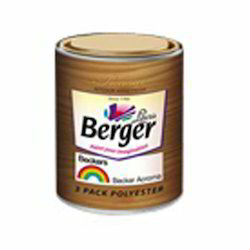 We have a remarkable amount of experience in trading and distributing optimum quality array of Berger Paints & Products. Available in a variety of appealing colors and shades, these paints are extensively utilized in construction of homes, offices and many more. 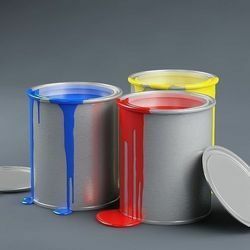 We are offering Coal Tar Epoxy Paints to our clients. Remove grease oil and other contaminants preferably by using bison degreasing solvent blast dean to a minimum of sa 21/2 swedish standard sis 05 5900 with a surface profile not exceeding 65 microns. If blasting is not practical, make full use of mechanical tools along with manual chipping and wire brushing to remove loose rust and scale to st. 2 swedish standard sis 05 5900. Excessive burnishing of steel is to be avoided. Thoroughly dust down all surfaces. 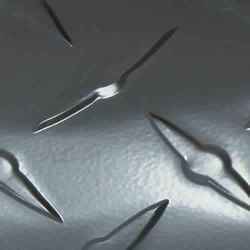 Best results can be achieved if the manually cleaned surface is primed with protectomastic - self priming surface tolerant coating. The surface should be dean and dry before application of appropriate primer coat. Concrete : new concrete: ensure that the concrete is cured for a minimum of three months. The surface is to be made rough and free from laitance and other contaminants by sand sweeping. Old concrete: remove all salt deposits from the surface by water jet washing. Light sand blast the surface to remove all loosely bound coatings and roughening up of firmly adhering coatings to ensure anchorage with recommended system. Ensure all dust/other particles are fully removed by suction or air blast and the surface is fully clean and dry before application of paint. In non-critical areas where blasting is not possible, water jet washing and hard wire brushing are minimum requisites. Tip pressure 11-16 Kg/cm sq. 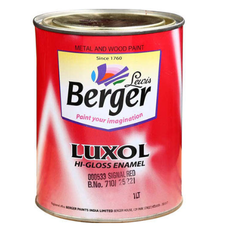 We are offering Berger Torpedo Synthetic Enamel Paint to our clients. Remove grease oil and other contaminants preferably by using Bison Degreasing Solvent Blast clean to a minimum of Sa 21/2 Swedish Standard $15 05 5900 with a surface profile not exceeding 35-40 microns. If blasting is not practical; make full use of mechanical tools along with manual chipping and wire brushing to remove loose rust and scale to St. 2 Swedish Standard SIS 05 5900. Excessive burnishing of steel is to be avoided. Thoroughly dust down all surfaces. The surface should be clean and dry before application of a suitable primer coat. Brush/Roller : Apply Without thinning. Conventional Spray : Add maximum upto 10-20% Thinner 800, if required. Handgun with 66 Fluid Tip, 70 thou Orifice, 50-60 atomising pressure. Airless Spray : Add upto 5% Thinner 800 if required. Use any Standard equipment having pump ratio oí 30 : 1. Tip size 028-038 mm. Tip pressure 11-16 Kg/cm sq. Customers can avail from us a wide range of Tank Liners Paint. These are extensively acclaimed for optimum quality, dimensional accuracy and robustness. Linosol Chlorinated Rubber Paint is suitable for steel structural and concrete surfaces of chemical and fertilizer industries, breweries, laundries, pulp and paper plants. Theoretical Spreading Rate 4.6-5.8 Sq. Mtr./Ltr. 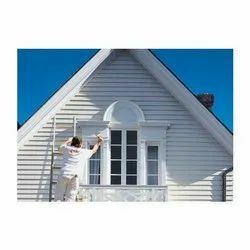 We are offering High Build Finish Paint to our clients. Recommended for use on offshore platform structurals, helideck, and accommodation areas as well as underdecks and above water areas of jackets. The product is also suitable for application on ms & concrete areas of fertilizer plants, chemical units, refineries, petrochemicals, metallurgical units, etc. A two pack epoxy high build coating with superb performance in severe marine and industrial environments. The product has excellent resistance to chemicals and solvent fumes, splash and spillage. Theoretical Spreading Rate 5.4-6.7 Sq. Mtr./Ltr. We are offering CTE Super Black to our clients. An ideal coating for protection of sluice and barrage gates, caissons, hydel penstocks, pipelines, storage tanks and structuralsteel work in fertilizer. Chemical, refineries and coastal installations. A two pack high build epoxy tar coating having excellent water and alkali resistance. This is suitable for protection of steel in conjunction with cathodic protection system. It withstands back-filling materials and is not affected by alkalinity orsulphates in soil water. 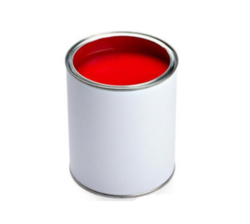 We are offering High Build Enamel Paints to our clients. Recommended for application on structural steel, pipelines, storage tanks, etc. , subjected to aggressive environment. Suitable for application on concrete walls and columns. Can be used in fertilizer plants. Chemical units, tank farms, offshore installations and various other industries including aqua culture. We are offering High Build Epoxy Finish to our clients. Uses: Recommended for use on steel structural and tank exterior of fertilizer plants, chemical units, refineries, petrochemicals, power generation units or onshore installation. Scope: A two pack high build epoxy finish with excellent performance when exposed to a wide range of corrosive chemicals and marine/industrial environments. We are offering Boiler Paint to our clients. We provide high-quality products to our customers. 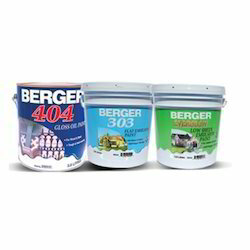 Looking for Berger Paints ?